Description: NS C22 starts its journey east as a Wheeling-Pitt SW1500 passes it going down their incline. Description: Here 179 meets 3 northbounds...let the parade begin! Description: Train 204 is overtakes train M72 at North Kannapolis, M72 will follow 204 into the single track to Reid shortly. Description: EB doublestack/intermodal, 1815 hours. Description: EB mixed TOFC & intermodal, 18th Avenue, 0759 hours. Description: Roster shot of a B32-8. Description: Closeup of the short hood end. Description: Eastbound as it comes off the Harrisburg Line at CP Wyomissing Jct on to the connecting track with a warbonnet leading. Description: H-74 approaches CP-Richards @ 10;15 hrs. Description: Just around the curve sits the former DL&W Depot at Mt Bethel.. Description: Local H76 heads east with interesting power meeting the 38T power drifting back. Description: NS local H76 EB heading for the Portland Secondary at Phillipsburg. Description: Ex-Conrail #3312 heads push/pull local past Phillipsburg Railroad Historians Museum @ 1207h. Description: NS H76 prepares to interchange cars for BR&W to pick up. Description: One of a few of these not in storage. Description: NS B32-8 3550 sitting in the siding at Pearisburg, VA with SD40-2 6086, an ex-N&W caboose, a 150 ton crane and a few gons. 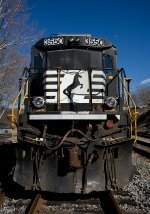 Description: NS 3550 sits in the siding in Pearisburg, VA on a cold clear February day.